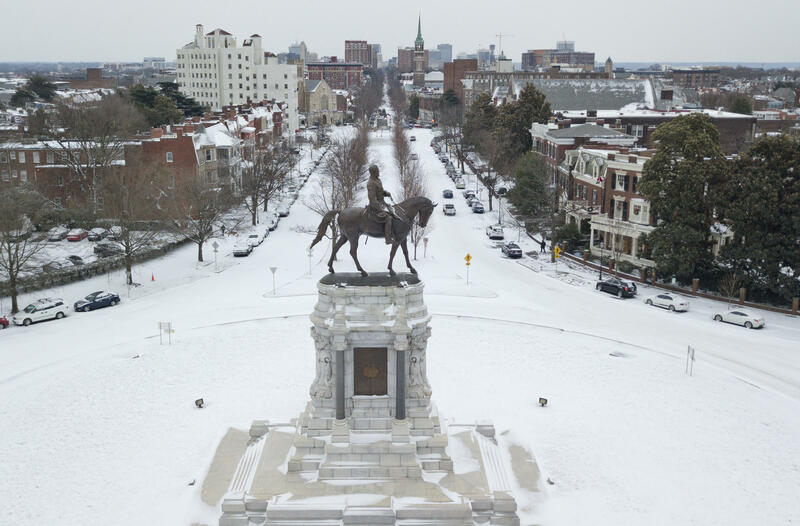 Snow covers the traffic circle around the monument of Confederate General Robert E. Lee on Monument Avenue in Richmond earlier this month. Many schools and businesses were closed Wednesday because of snow. But lawmakers in Richmond were hard at work. And, as Michael Pope reports, they are considering two snow-related bills. Many of the bills lawmakers are considering here in Richmond come directly from their own personal experience. Take Delegate Mike Mullin, a Democrat from Newport News. He has a bill that would create a new penalty for drivers who don't remove snow from their cars before getting on the road. And then there are all those sidewalks that clogged with snow. Delegate Steve Landes, a Republican from Augusta County, has a bill that would allow local governments to create penalties for homeowners who don’t remove snow from their sidewalks. Some local governments in Northern Virginia already have the authority to do this, but others don’t. Landes introduced the bill because county leaders in Albemarle are interested in creating a new penalties for homeowners who don't remove snow from their sidewalks.